The DM1900 is the latest update of Margaritaville’s extremely popular Key West line of home margarita machines. The new Key West gets a larger ice reservoir and 4 preprogrammed settings. 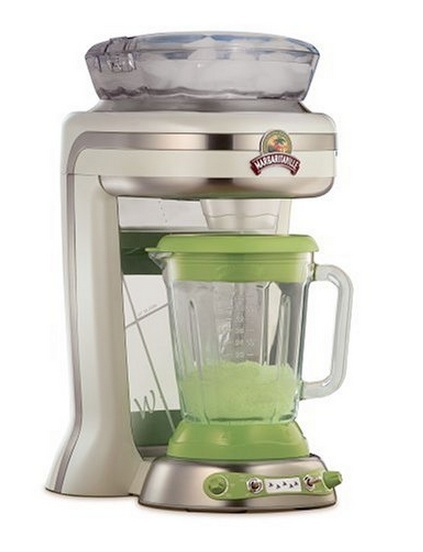 Give your party a special touch by serving restaurant – quality frozen beverages with this distinctive Margaritaville Frozen Concoction machine. Much more than simply an regular blender, the machine mechanically shaves ice and blends up to thirty two ounces of your desired cool drink, all at the tap of a button. Basically just pour the ingredients into the glass jar and put ice in the top reservoir. Choose how many drinks to make, and the appliance automatically mixes the correct amount of ice by the ingredients. Additional highlights consist of easy front access controls, a steady footprint, an easy-to-clean design, and a solid handle and drip-free spout on the glass jar for elegant serving. « National Margarita Day: A Cocktail in the Cold?